This arm monitor has an irregular heartbeat detector, a BP risk category indicator, allows multiple users to store readings separately and includes a one-size-fits-most cuff. It also has a large digit display, data averaging function and can download memory. 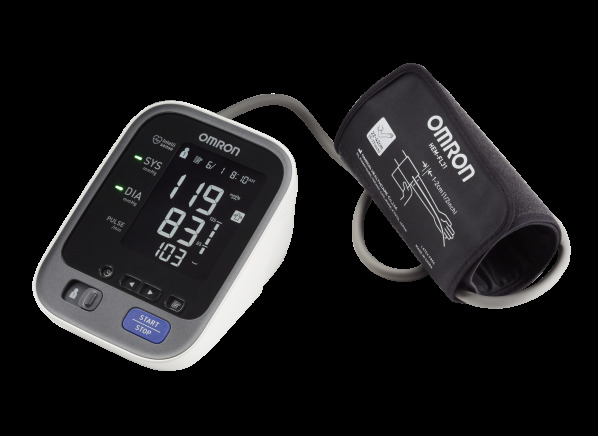 The Omron 10 Series BP786N is part of the Blood pressure monitor test program at Consumer Reports. In our lab tests, Blood pressure monitor models like the 10 Series BP786N are rated on multiple criteria, such as those listed below. Accuracy: Accuracy is based on how the model's readings compared with those taken on a mercury sphygmomanometer used by two trained testers. Convenience: Convenience is based on pluses and minuses of the model's features (such as irregular heartbeat detection, a blood-pressure risk category indicator, and multiple user memories). Comfort: Comfort is based on opinion scores given by test subjects. Irregular heartbeat detector Irregular heartbeat detector A symbol on the monitor that indicates that an irregular heartbeat rhythm was detected. BP risk category indicator BP risk category indicator An indicator on the monitor that flags high readings as hypertensive. Multiple user memories Multiple user memories A feature in which two or more individuals can store their results separately on the same monitor. Two cuffs or one that fits most Two cuffs or one that fits most Two cuff sizes (large and medium) or a one-size fits most cuff is included with the monitor. Can download memory Can download memory The user is able to download readings from the monitor to a PC or other device. More portable than most More portable than most Smaller than most in weight and volume. Large digit display Large digit display Large systolic and diastolic digits. Data averaging function Data averaging function The monitor averages blood pressure readings. Included cuff sizes (in.) Included cuff sizes Cuff sizes that are included with the model. Available cuff sizes (in.) Available cuff sizes Cuff sizes that are not included with the model but available for separate purchase. Positioning indicator Positioning indicator A sensor indicating that the user is holding the unit in the correct position at heart level. (For wrist units only). AC adapter AC adapter An AC adapter is included with the monitor.